It’s not fun to live out of a suitcase, but it's a necessity on some trips. If you’re not well organized, mornings are especially hectic, and finding and repacking your belongings can be a nightmare. When planning for a trip where you’ll be on the move, choose clothing that doesn’t wrinkle, does double-duty (day and night), and is wearable multiple times. No one will remember what you’ve worn. On the other hand, pack enough essentials for every day, such as undergarments and socks. If your hotel stays are just one night, you won’t have drying time for hand laundry. While I use a myriad of packing organizers in many sizes, I don’t find them useful for this type of trip. I stick to simple, everyday storage items when I’m unable to unpack my suitcase. 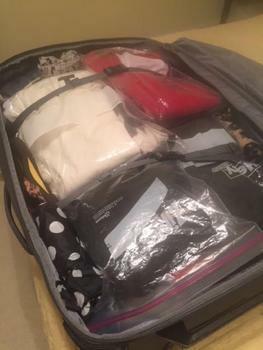 What I prefer is a lightweight suitcase with lots of pockets, hanging toiletry bag, jumbo zippered plastic bags, gallon plastic bags, quart and sandwich bags, shoe bags in different colors, and zippered pouches. Pack one complete outfit in a large bag for your first day that you’ll store on the top along with whatever you plan to sleep in your first night. Group like items: short-sleeved tops, long-sleeved tops, pants, sweaters, outerwear such as gloves and scarves, accessories, undergarments, socks, etc. Fold items carefully and pack like items together in plastic bags, never overstuffing. If need be, use multiple bags. If you are bringing specific outfits for evening or another occasion, pack all of your items together in one plastic bag, such as: dress, belt, slip/hosiery/undergarments, wrap, dress bag or slacks, shirt, tie, belt, and socks. Use the zippered pouches to group like items, such as: hair styling products, shaving products, sewing kit, emergency kit, makeup, and makeup brushes. These pouches are useful for jewelry and medications; just place them in your carry-on bag. Organize all your toiletries in the hanging bag’s zippered compartments by type -- for example: dental, face, eyes, etc. -- and store this in an outside pocket. If possible, choose a different color shoe bag for each pair of shoes so they’re easy to locate. Pack a few empty plastic bags; you’ll find them useful throughout your trip. Pack your heaviest items on the bottom, usually shoes. Begin layering your bags, folding them to fit. Continue to add your bags and pouches, placing lightweight shoes, travel umbrella, and thin pouches on the sides. If you have bags with items that can crease, put those aside to either layer on the top or place in the zippered compartment on the upper inside. Be wary of leaving anything loose. If you stick undergarments, socks, belts, etc. in small crevices, you’ll be hunting for them at every stop. Pull your outfits together the night before and store the days worn clothing. Designate a plastic bag for dirty laundry. It’s easy to forget an item if you are packing up each day, so do a double check before exiting your room. This type of packing takes extra time, but you will be grateful you did it the entire trip.